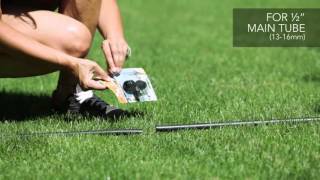 Designed for do-it-yourself irrigation, it is guaranteed perfectly watertight, thanks to the push-in system that facilitates tool-free connection. Specific for connecting pop-up micro-sprinklers to the main hose. Used for connecting underground Colibrì® microsprinklers in series (cod. 90210 - 90220 - 90230). With 1/2” (13 - 16 mm) main hose.